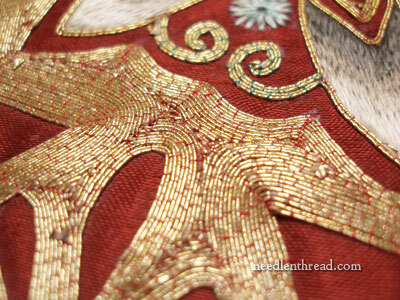 Today, I’d like to share with you some photos of a beautiful little piece of goldwork and silk embroidery, and perhaps meander through some musings about its background and make some comparisons with another piece of embroidery. 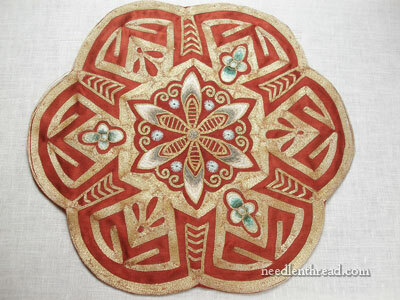 This is a piece of embroidery – one of four – that was sent to me by Larissa (thank you, Larissa! ), a friend in Russia. If you’ve been reading Needle ‘n Thread for a while, you might remember Larissa. She’s the embroiderer behind this gorgeous goldwork and pearl embroidered frame and this bead and goldwork frame. Both pieces within both featured frames, by the way, are also embroidered – worked in tiny tent stitch! Here’s the medallion. It is worked in incredibly tiny gold threads, with some silk embroidery, on a red silk background that has faded to a kind of rusty-brick red. The medallion is 10″ in diameter. 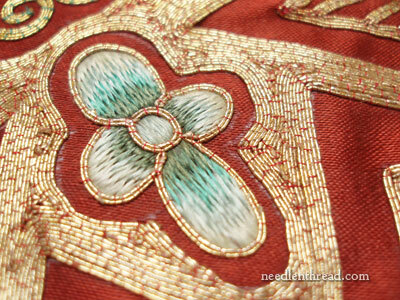 The tiny gold threads are couched with a fine red thread, except for the curling tendrils in the center, which are couched with green. 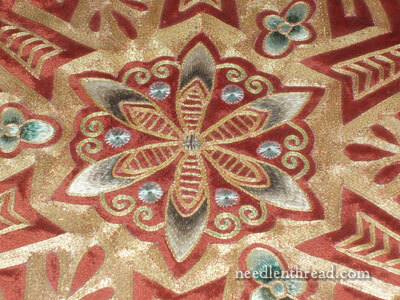 The three silk accents on the outer part of the design are worked in silk, outlined with gold thread. The silk on these little “flowers” has a touch of greenish-aqua in it. I believe the color has faded a little bit. In one of the flowers, the aqua is barely discernible, while in the other two, it is much more noticeable. Notice, too, that you can see the paint line from the design transfer. The silk embroidery on the petals in the central part of the design has no color – it fades from a dark taupe-ish grey to a soft white. Here’s a photo, taken from a little distance with the flash on, so that you can see the gleam of the gold when the light hits it right, and you can also see the “movement” of the gold around the central design element. 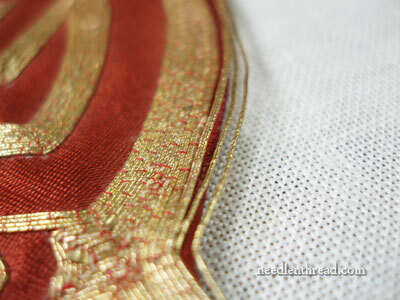 Notice how the gold looks a little scalloped. This is due to the direction it is couched onto the fabric. Pretty, isn’t it?! The piece is in very good condition. There is only one spot where the gold threads are coming off the edge, and I plan to carefully tack these back in place so that I can frame the piece for display. 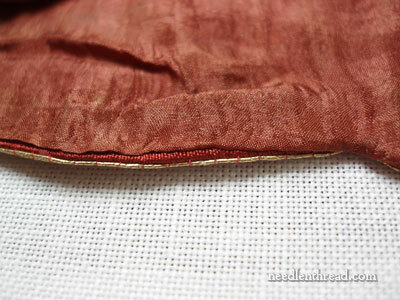 The back of the piece is finished neatly with silk, so that the back of the work is completely covered. So I’ve been musing over this piece. 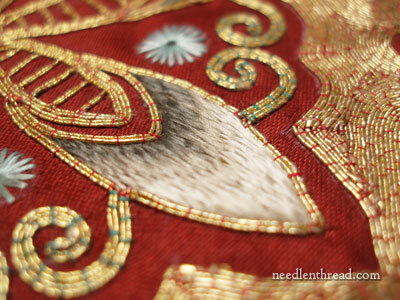 It reminds me of another piece I showed you not too long ago – this bluebird in silk and gold embroidery. I suspect that both pieces were made for the same reason – as decorative pieces for the home, made commercially and sold. I think this is definitely Chinese embroidery, though the design is not necessarily as “Eastern” in flavor as the bluebird is. I would guess the piece was made sometime in the 20th century, perhaps early 20th century, but I’m not entirely sure. But I definitely think it is Chinese, and it was made for commercial purposes. I love it! I plan to frame it, though I don’t think I’ll use a double glass frame like the bluebird. I’ll be sharing photos of the other pieces with you soon – they just get better and better. There’s an exquisite example of 19th century ecclesiastical tambour embroidery, mixed with goldwork. Fantastic stuff, and the colors and shading are terrific! Thank you, Larissa, for the beautiful gift! Mary what a beautiful piece! Lucky!!! What a wonderful friend ro have sent you such a beautiful and priceless heirloom gift. A big thanks to both of you for your generosity and kindness! Larissa, for sending it to you and to you, Mary, for sharing it online. I am really thrilled on the way the beaded frames are mounted. I would like to have an idea, on mounting the bead frames. Is it worked in any fabric and then mounted very nicely. Or making bead embroidery on card is much easier and is is possible to do bead embroidery on card ? The color combination (which was always my soft point) leave me ecstatic. Wonderful piece! You deserve it because you always share with us such treasure in the form of tutorials. Have a lovely day. Next Next post: Stitch Printable: Cast-On and Double Cast-On Stitch!